Because eggs are high in protein and can be kept soft, they are an ideal food for someone who’s undergone weight loss surgery. Eggs have many different applications, from scrambled eggs to light and airy soufflés. No other food is as versatile or can be so diverse in so many recipes. Egg substitutes are often used to help lower the fat and cholesterol contents of a dish. These products are made mostly of egg whites, which contain a good amount of protein. They’re excellent to use in dishes that contain high-fat ingredients, like cheese, to help keep the calories and fat content lower. If you’re making scrambled eggs, you can substitute the whites of two eggs for each whole egg. So if you’re scrambling four eggs for breakfast, make it healthier by using two whole eggs and four more egg whites. If you want to reduce the cholesterol even more, use one whole egg and six egg whites. After surgery some people have difficulty tolerating eggs. This has a lot to do with the texture: If a cooked egg is too rubbery, like a hardboiled egg, you may have trouble getting it down and keeping it down. Try a fluffy scrambled egg instead. Preheat the oven to 350 degrees F. Pour 1 cup of water into a 9-x-13-inch baking pan and place it to the side. Using nonstick cooking spray, grease an 8-x-8 baking dish. In a small bowl, beat together the eggs, sugar substitute, vanilla, and salt until well blended. Then pour the nonfat evaporated milk into the egg mixture and stir until blended. Mix together the raspberries and blueberries and spread on the bottom of the 8-x-8 pan. Pour the egg custard mixture over the top. Bake for 35 minutes, or until a knife inserted in the center of the custard comes out clean. After removing the finished custard from the oven, sprinkle the nutmeg on top. Per Serving: Calories 178 (From Fat 28); Fat 3g (Saturated 1g); Cholesterol 111mg; Sodium 326mg; Carbohydrate 24g (Dietary Fiber 3g); Protein 13g; Sugar 21g. Be sure not to use sweetened condensed milk, made by adding a whole bunch of sugar to whole milk and then removing 50 percent of the water. The high added-sugar content can cause dumping syndrome if you have had GBP. Preheat the oven to 350 degrees F. Spray a 9-x-9-inch baking dish with nonstick spray. In a large mixing bowl whisk eggs for 2 minutes. Add the Canadian bacon, green onions, and spices and mix well. Pour the mixture into the baking dish and top with baby spinach and cheddar cheese. 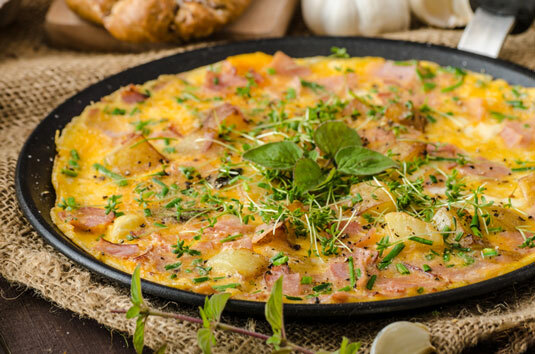 Bake for 25 minutes, or until the center of frittata is firm. Let cool for 5 minutes before cutting. Per Serving: Calories 175 (From Fat 91); Fat 10g (Saturated 4g); Cholesterol 332mg; Sodium 541mg; Carbohydrate 3g (Dietary Fiber 1g); Protein 18g; Sugar 1g.